Mamaki raised Schäfer from his bed of sand and, taking his hand, led him into the deep recesses of Akshobhya’s domain. They arrived at a precipice over which Schäfer viewed a large waterfall that spiraled downwards into an icy blue-mist. As if lifted upon the wings of the air his body came to rest directly beneath the cascading water as its tremendous torrents rushed down and over his startled frame. Naked, his body soon became one with the powerful and incessant flow of the water and its accompanying sound that pierced him to his very core. 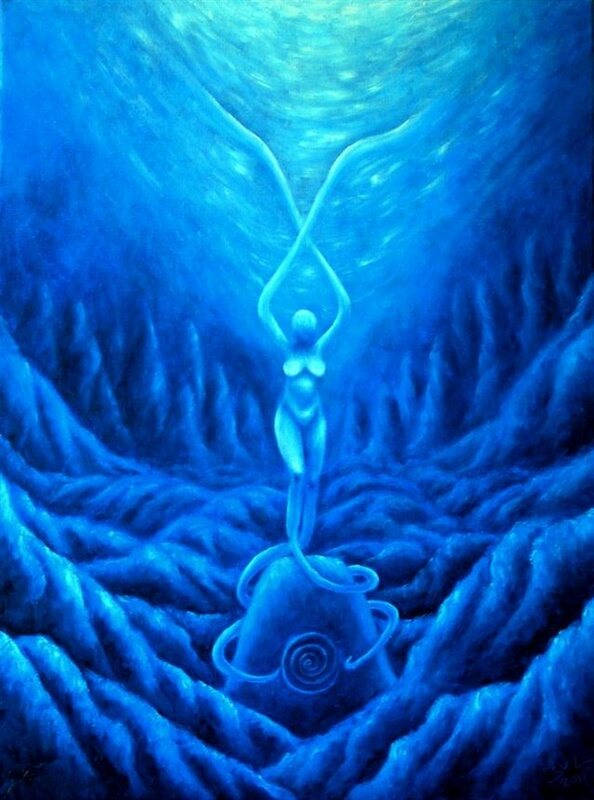 A soothing female voice clarified that his lifeforce was becoming energized with prana (Qi) and that soon he would become part of the cosmic-ocean of mahaprana. Soon he awakened to the realization that he was not some separate and isolated persona bobbling about in the raging sea of samsara, but was indeed raised to a higher frequency of awareness (bodhipower). With this quantum-cognizance it was as if he was AT-ONE-MENT with the force of the water that at first chilled-him to the bone. Now he was able to generate great quantities of inner-heat that enhanced his inner-strength and vitality. Acala (Skr. : Acala, Achala अचल; “immovable” one) is a guardian deity primarily revered in Vajrayana Buddhism in Japan, China and elsewhere. He is classed among the vidyārāja and preeminent among the Five Wisdom Kings of the Womb Realm. 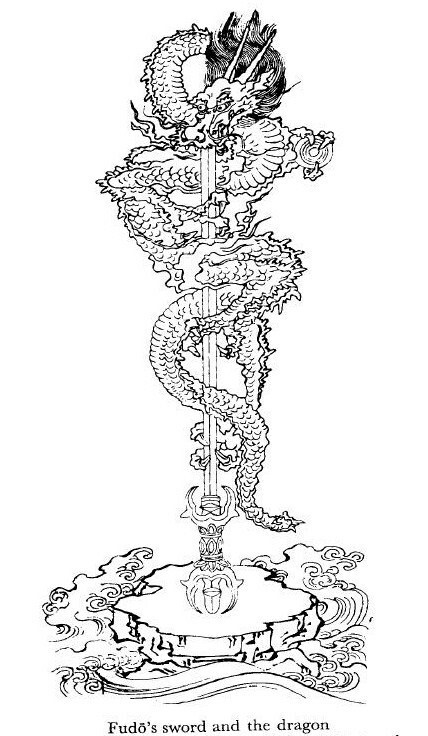 Accordingly, his figure occupies an important hierarchical position in the pictorial diagramatic Mandala of the Two Realms. In Japan, Acala is revered in the Shingon, Tendai, Zen and Nichiren sects. *Fudō Myōō’s role is that of mystic guardian. 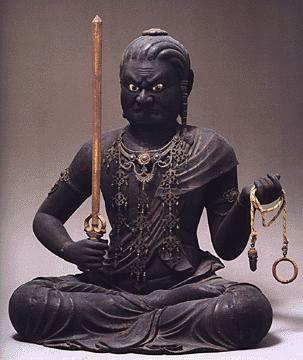 Fudō is the central and paramount figure in the group of divinities known as the Godai Myōō or Five Great Bright Kings, who in esoteric Buddhism stand as emanations or modes of activity of the Buddha. Where the Buddha exists static and immovable, withdrawn from activity, the five Myōō act a his agents and messengers. This is the divinity of whom the great majority of (Japanese) ascetics look upon as their guardian…who endues them with vitality and confers upon them mystic powers. He carries the “kurikara” or devil-subduing sword in his right hand (representing wisdom cutting through ignorance); he holds a rope in his left hand (to catch and bind up demons); he often has a third eye in the forehead (all-seeing); often, he is seated or standing on rock (because Fudō is “immovable” in his faith). Also, this is linked with serpentine, or naga energies. The naga is a Lankavatarian connection. I dreamt recently of a large-serpent crawling across my body, biting my left arm—not injecting any lethal poison, but rather secreting ambrosia of divine origin. All of these ascetic renderings can help to boost the pranaic-fields, thus empowering Mind to better develop the manomakayic-body in order to experience the Sambhokayic-plane. This entry was posted in Mystagogia, Notes from the Iron Stupa and tagged Acala, Fudō Myōō, Mamaki, Prana, samsara. Bookmark the permalink.